Stuff Your Stockings With Pirate’s Booty – Last Minute Stocking Stuffer idea! You are here: Home › Fun › Stuff Your Stockings With Pirate’s Booty – Last Minute Stocking Stuffer idea! Who said stocking stuffers just have to be toys? When I make my kids goodie bags, I love to add more fun healthy snacks and only a few toys and candy items. So why not do the same for your kids Holiday stockings! These 1-oz. 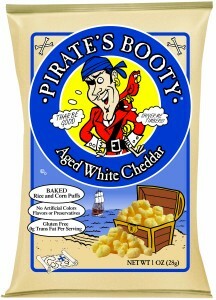 bags of Pirate’s Booty Aged White Cheddar are a fun (and delicious) stocking stuffer that kids can snack on while opening presents or between breakfast and dinner! This idea is a no brainer because you know it will get eaten since it tastes so good too! Not to mention the cute 1oz packaging will fit in any size stocking hanging on your mantel! Let me know if you decide to try this idea out! Have a Happy Holiday!